By 1862, Jean-Léon Gérôme (1824–1904) had reached the height of his narrative powers, exhibiting a succession of narrative paintings, several of which had been turned into prints and were selling strongly. His popularity had not gone unnoticed by the Imperial court, which was also at its apogee at the time. In 1863, Gérôme married Marie Goupil, the daughter of Adolphe Goupil, proprietor of the gallery which was flourishing thanks to Gérôme’s paintings. Jean-Léon Gérôme (1824–1904), Reception of Siamese Ambassadors by Napoleon III (1864), oil on canvas, 128 x 260 cm, Château de Versailles, Versailles, France. The Athenaeum. Gérôme articulated Napoleon III’s aspirations for empire in his elaborate formal painting of the Reception of Siamese Ambassadors by Napoleon III (1864), depicting a grand reception held at Fontainebleau on 27 June 1861. Gérôme had attended in the role of semi-official court painter (he was commissioned by the State), made sketches of some of the key figures, and was further aided by photographs made by Nadar. He also included himself, and the older artist Ernest Meissonier (1815-1891), in the painting: I believe that they are both at the back, at the far left. This work was shown at the Salon the following year, where Degas and Monet exhibited their first paintings. He continued his theme of empire with a painting of Cleopatra VII Philopator, known more widely as Queen Cleopatra, who had been the last active pharoah of Ptolemaic Egypt, ruling from 51 to 30 BCE. For much of this period she ruled jointly with relatives; in 51 BCE, when she was ruling with her ten year-old brother Ptolemy XIII, they fell out, and she tried to rule alone. In 47 BCE, she took advantage of Julius Caesar’s anger towards her brother by having herself smuggled into Caesar’s palace in Egypt, so that she could meet with the emperor. Although she was probably smuggled in inside a large bag, this has traditionally and more romantically been described instead as a large roll of carpet. She became Caesar’s mistress, bearing him a son, and convincing him to fight and defeat Ptolemy’s army at the Battle of the Nile, restoring Cleopatra to her throne. 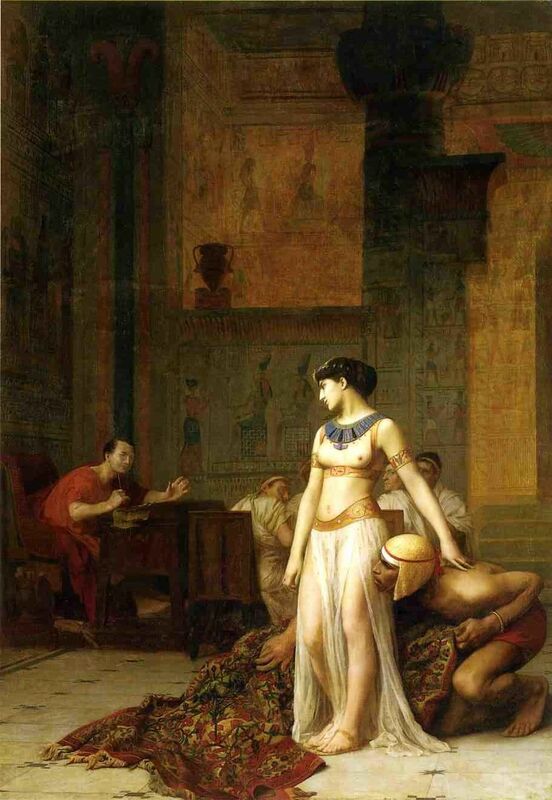 Gérôme depicted this in his Cleopatra before Caesar in 1866. Cleopatra is stood at the edge of the carpet from which she has just emerged, dressed (or undressed) for seduction. She looks at Caesar, her expression hard to read because of the angle of view of her face. Her breasts are exposed below an elaborate Egyptian jewellery collar, and wispy veils hang from a belt-like girdle slung from her hips. A slave cowers behind and to the right of her. Caesar is seen working at his desk, looking up at Cleopatra, his hands held out as if trying to regain control of the situation. Behind Cleopatra several men, presumably Caesar’s counsel, are sat at a table. This was shown at the Salon in 1866. At the time, the French diplomat Ferdinand de Lesseps and his company were busy constructing the Suez Canal in Egypt, which opened under French control in 1869. Gérôme was by his own admission not a religious man, and painted very few religious works. 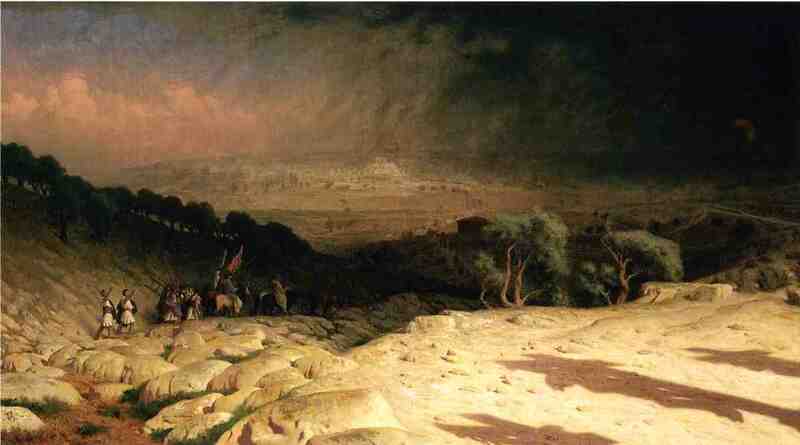 Of those Golgotha (Consummatum Est, or Jerusalem) (1867) is striking for its use of the shadows of the crucified, and for its exploration of the play of light, which was to become so central to Impressionism. This was exhibited to acclaim at the Salon of 1868. Jean-Léon Gérôme (1824–1904), General Bonaparte and his Staff in Egypt (1867), oil on canvas, 58.4 x 88.2 cm, Private collection. Wikimedia Commons. 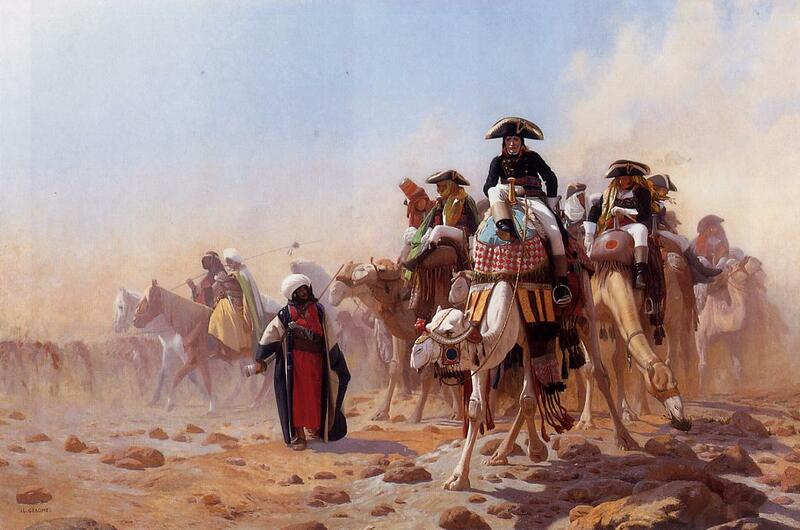 Gérôme made several paintings showing the first Emperor Napoleon in Egypt, including this highly detailed and intricate version of General Bonaparte and his Staff in Egypt (1867). The French Campaign in Egypt and Syria had been in 1798-1801, so this was still relatively recent history, even when viewed from the distance of the final years of the Second Empire, and the near-completion of the Suez Canal. This was also a historically relevant time to be painting the expeditionary successes of the First Empire: Napoleon III had demanded for France the left bank of the Rhine, Luxembourg, and Belgium the previous year, held an Exposition Universelle in Paris for much of 1867, and had been actively pursuing its empire in Mexico, Egypt, and south-east Asia. The following year, Gérôme courted controversy when he depicted the execution of one of Napoleon I’s leading military commanders – a strongly pro-Empire topic which he treated in an unconventional way. Michel Ney (1769-1815) was a leading military commander during the French Revolutionary and Napoleonic Wars, and was made a Marshal of France by Napoleon. Following Napoleon’s defeat and exile in the summer of 1815, Ney was arrested, and tried for treason by the Chamber of Peers. 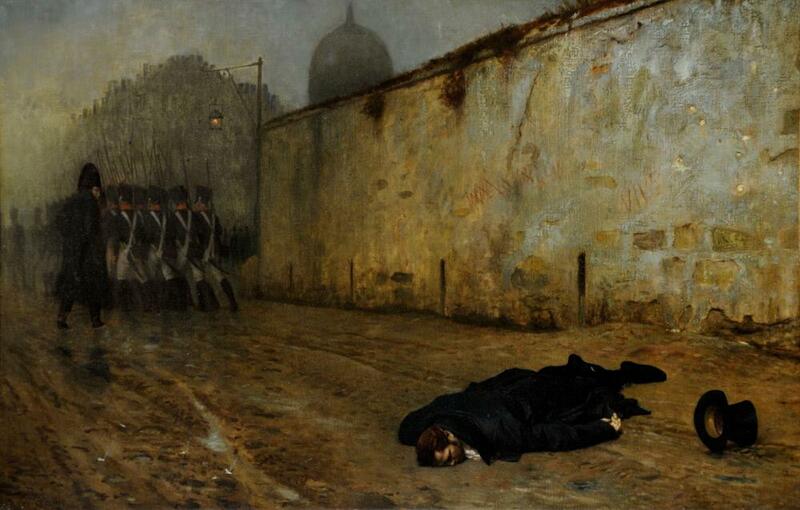 He was found guilty, and executed by firing squad near the Luxembourg Gardens in Paris on 7 December 1815. He refused a blindfold, and was allowed to give the command to fire upon himself. Jean-Léon Gérôme (1824–1904), 7 December 1815, 9 o’clock in the morning, The Execution of Marshal Ney (1868), oil on canvas, 64 x 103.5 cm, Sheffield Gallery, Sheffield, England. Photo from Militärhistoria 4/2015, via Wikimedia Commons. The Death of Marshal Ney (1868) uses a similar narrative approach to Gérôme’s earlier paintings of the murder of Caesar, in showing moments after the climax of the story. Ney’s body is abandoned, slumped and lifeless on the muddy ground, his top hat apart at the right edge of the canvas. Behind where he stood but a few moments ago there are half a dozen impact marks on the wall, from bullets. The firing squad is being marched off, to the left and into the distance. Gérôme achieves his narrative using composition, and cues such as the bullet marks, alone. Instead of the tense horror of the shots about to be fired, or being fired, (as used by Manet and Goya, for example), he opts for this cold, bleak, heartless execution, which is grimly effective. He has painted it as nothing less than a street crime, not an act of justice. Although the graffiti on the wall are hard to read in this image of the painting, both begin with the word VIVE (‘long live’). The first follows that with the word EMPEREUR (emperor), which has been crossed out, and in the second the subsequent word has been erased altogether. The uncertainty in these may refer to Marshal Ney’s enduring loyalty to Napoleon, but his oath of allegiance to the king when the monarchy was restored in 1814. This painting was exhibited at the Salon in 1868, where it became the centre of attention. As a painting, it appears to have been well-received, but its engagement in politics proved more controversial. The rising tide of Republicanism brought fierce debate over the issues raised. The Second Empire then entered dark days which led to the disastrous Franco-Prussian War in 1870. Gérôme avoided political controversy during this period with a succession of Orientalist works, many from a visit which he made to Egypt and Palestine in 1868; he also returned as an official observer to the opening of the canal. Being suitably escapist, they proved popular. As German forces closed on Paris in 1870, Gérôme fled to London, returned to Paris briefly in the autumn/fall, then went back to London. He finally returned to Paris in June 1871, after the suppression of the Paris Commune. Gérôme had started work on his most famous painting of all, Pollice Verso (1872), before 1869, but had temporarily abandoned it during the Franco-Prussian War. It was not, therefore, intended as comment on that war, nor about France’s sudden transition from Second Empire to Third Republic. 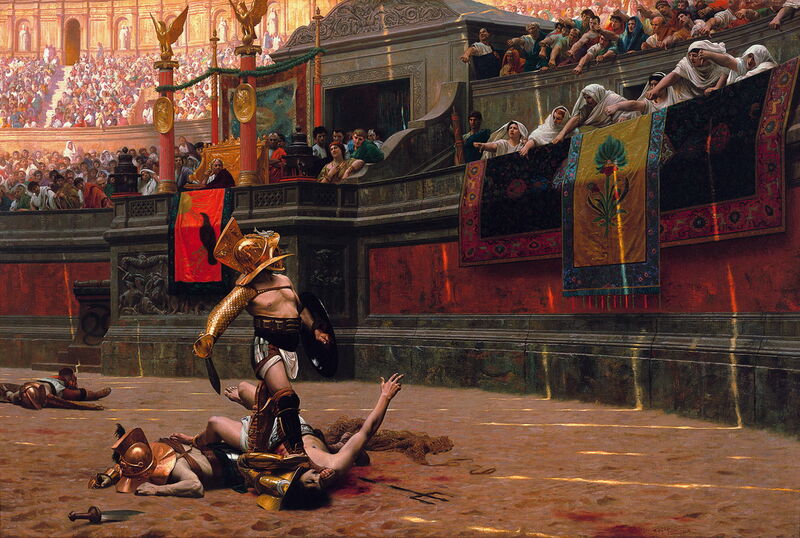 Instead, Gérôme looks at the power of expression – this time, a small gesture of the hand – in his favourite context, the Roman gladiatorial arena, which he had fallen in love with when he was first in Rome in 1843. It also develops a theme from his earlier Ave Caesar: that of spectators and their complicity in the horrific events taking place in front of them. His earlier paintings of the arena had been somewhat troubled by difficulties in achieving historical accuracy, in armour, weapons, and other details. Far from being a flight of fancy, Gérôme had spent a great deal of time and effort trying to make everything shown in this painting as historically accurate as possible at the time. For the artist, the success of the painting depended on its fine details. 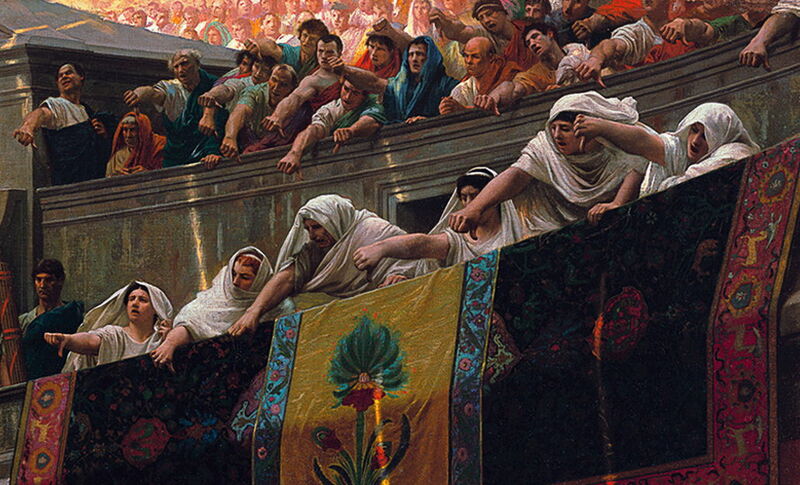 To be able to bring out those fine details, and the thumb gesture which was central to its title and theme, Gérôme had to draw in from the wide-screen spectacle of Ave Caesar, and concentrate on the gladiators, and a small section of the spectators, including the emperor, his court, and those closest to him – a row of six Vestal Virgins, to the right. The victorious gladiator stands with his right foot on the throat of the loser. He looks up at the crowd, to see whether he should kill that loser, indicated by thumbs pointing downward, or should spare his life, shown by thumbs pointing up. The title confirms what we can see: thumbs are down, and the gladiator on the ground is about to be brutally killed. Critical commentary became focussed on the row of Vestal Virgins; in Gérôme’s earlier Ave Caesar, they had been sufficiently distant that their expressions and body language couldn’t be read. Here there was no doubt: they were baying for blood, which some critics found frankly revolting. However, it speaks clearly about the Romans’ enjoyment of such events, and a moment’s reflection should make us think more deeply about our own fascination in the suffering of other humans and animals. This painting was first shown at a private Salon in 1873. Goupil turned it into a highly lucrative series of prints, which sold strongly until well into the twentieth century. For Gérôme it also provided the figures for his first full-scale sculpture The Gladiators, which was a huge success of the Exposition Universelle in 1878, and is now in the Musée d’Orsay. Pollice Verso had the unintended consequence of making thumbs up and down signs part of the universal non-verbal vocabulary. The Romans did use hand signs involving the thumb to indicate their approval of gladiators killing their losers, but it is now thought that these were rather more complex than those shown by Gérôme. This painting appears to have been responsible (at least in part) for defining the meaning of thumbs-up and thumbs-down gestures in popular communication. With the days of the Second Empire past, Gérôme now had to paint for the Third Republic, and the many changes which it was to bring to French society – a challenge I will look at in the next article in this series. Posted in General, Life, Painting and tagged Gérôme, narrative, painting, realism. Bookmark the permalink.